The coming of the bright and haunting Harvest Moon speaks of the coming change. The veil between the world of the living and the realm of the dead thins. For some it is All Hallows Eve. For others it is the anniversary of their death or the nearness of those that the spirits feel compelled to visit. But, one thing remains true no matter the identity of the spirit or the reason for their returning: it isn’t always precisely safe. Between the poltergeists and the ghouls, you know that someone is going to act up and that means someone is going to make that call. Ugh, that annoying siren and those ridiculous costumes. One little moan and suddenly there are proton packs and laser beams being fired everywhere! So, when you return to the land of the living, be sure that you do so with some finesse. Show some elegance and the kind of spiritually aware maturity that will keep those people from hollering out their worries of “Who You Gonna Call?” Of course, it can be difficult. Hopefully you weren’t murdered and your call back is from vengeance. But, even if that’s the case, a little care in how you appear can make everything go so much more smoothly! That is where we come in. 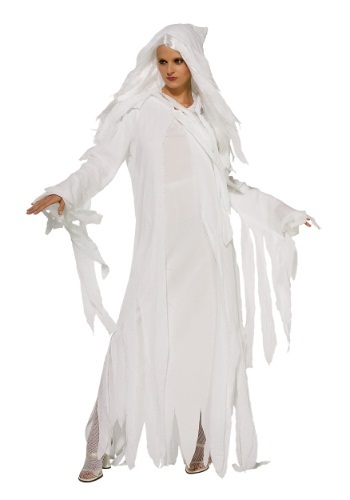 In order to keep your spiritual visit seeming as innocent as possible, we have this Ghostly Spirit Women’s costume that will make you seem as if lying into the realm of the living is an almost welcoming experience. The full length white pullover robe has an interior base that makes it form fitting while the flowing fabric gives you that haunting look of the hereafter, especially with its jagged hemline. Long fringed strips of cheesecloth hang from your collar and sleeve, giving an ethereal look that perfectly matches the silver-white of your haunted wig. Rejoin our realm but, remember, keep the peace! Fit perfect. Impressed with the material.